Well, the sun never came out (hello, Washington in December!) but in spite of the rather dreary day, I got a few pics of my Christmas mantel. While in our dining room I added pops of red this year, in this room I decided to go with a more simple palette of just green, silver, white and brown tones. Our family room is loud enough without the added contrast of color! I need visual calm! I mixed quite a few shapes and textures for my mantel again this year. Lots of shine and texture from mercury glass, some roughness from the letters and the metal flower bucket, I added a little sheen and curvy shapes with the white pitchers and brought in some softness with my quilted white stockings. There is lots of great natural texture from the green foliage and the awesome shape of the book page wreath layered on the textured mirror finishes it all off! I’ll pull back and show you the tree and some other festive corners of the house on Monday! And because I get emails and comments daily now asking to see more photos of Jack (Ha! He really needs his own fan club), here is a little behind the scenes of us trying to get him to pose with his Santa hat. We couldn’t even get it ON his head because he grabbed it first. We really tried to get it out of his mouth and on to his head. Really. We tried. It turned into a tug of war. His favorite game. We eventually got the hat out of his mouth, but we struck out on him wearing it. Maybe by Monday we can get him to pose with it on his head. Maybe. Or not. Thanks for stopping by to check out my Christmas mantel! Can’t wait to have you over on Monday! 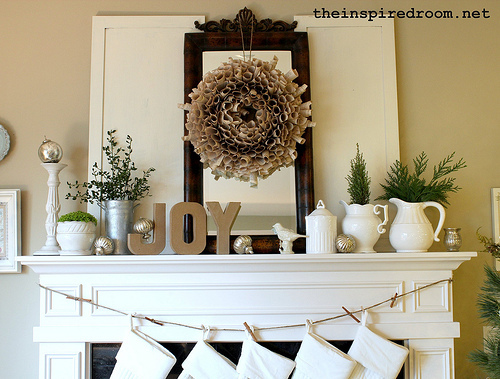 The 2011 Christmas Home Tours @ The Inspired Room start at 6PM PST Monday! Here are some of the details on when and how the party works! 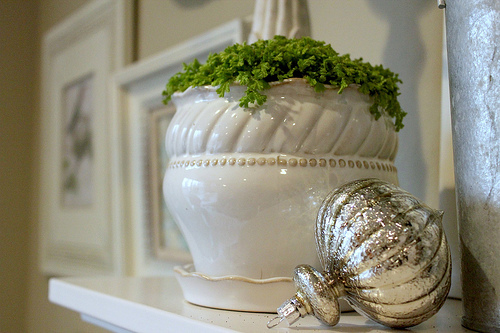 *I’m linking up this mantel post to parties at Hooked on Houses and Southern Hospitality! He is so dang cute! Oh, and the mantle looks good too ;) Love the calm colors. It looks so classic and chic. Love the look, just can’t ever seem to get it myself? Hmm… Anyhow, Merry Christmas!! Thanks Shannon. :-) Merry Christmas to you too…see you Monday!! Thank you Ashley :-) I’m excited about Monday!!! See you then! Love your mantel, so creative and elegant! And your dog is incredibly cute. Yes…what am I doing up at 1:16 a.m. when I have to get up for work! The mantel is stunning and I’m all for visual calm this year…must get some sleep now! Beautiful! My favourite nature inspired colours: brown, green and white. Our gloomy weather doesn’t stand a CHANCE in taking over your wonderful light and bright! STUNNING! I love it so much! I have mantel envy…. Love the way you’ve hung the stockings, and the mirror with the wreath is beautiful! I am normally a major fan of red, but your quiet and calm mantel is very fitting of the season. Looking forward to seeing all the gorgeousness on Monday! I don’t say this often, but your mantel is perfect! And Jack is so adorable. Fabulous! I think this is my most favorite yet! I love the simplicity…and yet there’s plenty of eye-candy…maybe the dangerous kind – haha! Seriously great texture amongst serenity. You are on your game…looking forward to the big reveal! And the mirror is gorgeous. Love it!!! And the touch of restrained elegance it brings. 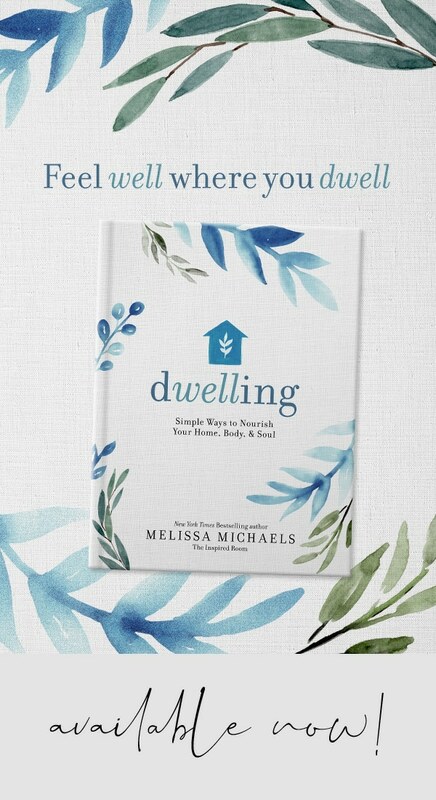 Melissa you always speak my language…I love the visual calm!!!! I am going for that too…..my family is rowdy so I need a peaceful backdrop for balance. Your mantle look great!! And Jack is so cute. Yes, Jack needs a dog blog. Simplicity at it’s best! Merry Christmas! Oh, wow, I LOVE your mantel. 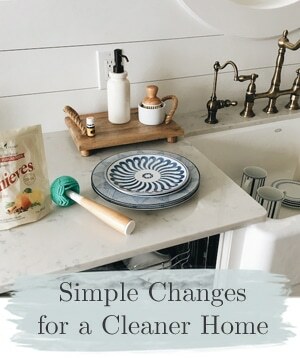 This makes me want to try a neutral one next year (if my daughter will let me–she has very firm ideas about how we decorate for Christmas around here, ha). I meant to type that I love seeing that PUP of yours. LOL. The mantle is just beautiful! and the dog is just adorable! How’s your little Westie doing? my lil ole gal is snuggled up on the sofa with her sweater and a blanket! It’s just gorgeous. I love the brown mirror against all the white. My colors are brown, green and gold this year. It feels so calming. I’m excited to link up on Monday! Oooooh, I love, love, love your mantel! It’s one of my faves I’ve seen so far. I’m a sucker for white pottery and the bird is bonus points. 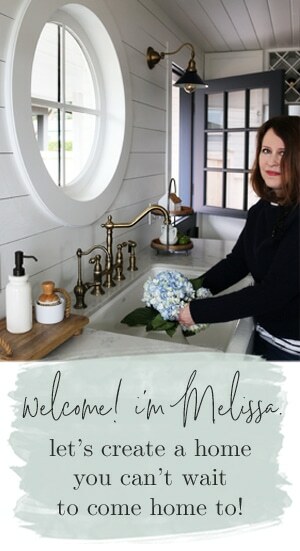 So pretty Melissa! Jack makes me laugh! I also read another blog with a new kitten named Jack that is always up to mischief. 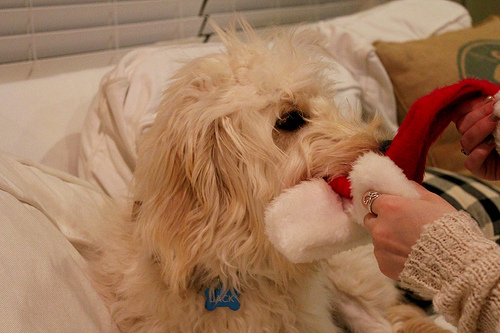 He’s been carrying around a red pom-pom in his mouth. 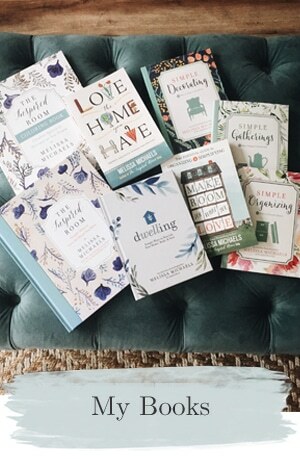 (Susan Branch’s blog. I love your mantel. More and more I am loving simpler decorations and yours is gorgeous. I love it! I went with a more simple/natural look on my mantel this year, too. Can’t wait to see the rest of your decorations! It is so calming, clean and beautiful!! 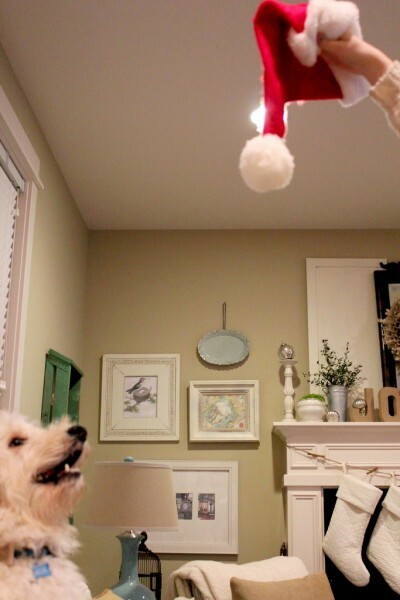 I love how involved the pup is in decorating!! I am just so glad to see my dog is not the only one who thinks hats and costumes for dogs are meant to be eaten not worn! Love the Holiday Mantel! So beautiful! 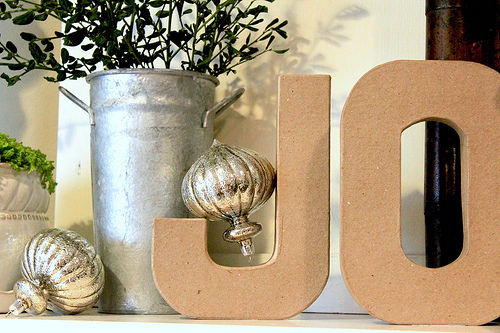 I have also used those same JOY letters, but I ended up spraying them metallic. I like the feel of the natural letters on your mantel. Thanks for sharing! It looks amazing, Melissa – well done! Oh, how I love the white and green fresh and natural look! I only have 5 inches of width on my mantle, so I’m struggling with finding things that are tall enough for a pop! But, not hanging off the front edge. Then she got smart…and starting carrying it around from person to person…asking for more treats to be put inside! Daisy would be a strange name for a male dog…lol. Your mantel is perfect- and Jack is just a character….makes me smile just to look at him. LOL that’s too funny! Jack sounds like our Buddy, he wont wear his hat either! In fact I even bought him a wreath that is stretchy to wear around his neck and it’s really cute on him. He likes that but not the hat. I LOVE your mantel! I love the unfinished craft letters, the wreath and the way you hung your stockings from a line rather than on the mantle itself! I may need to steal some of those ideas! It came together beautifully! 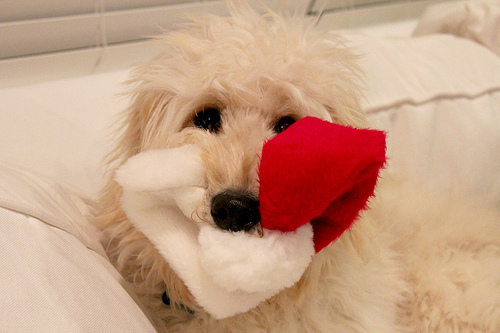 I pinned your mantle….I LOVE it!!! It is absolutely beautiful! He really is an adorable doggie, you know. Really. And your room looks beautiful! Well done, sweet lady–you’ve made everything look so lovely. I’m looking forward to your party! It’s sure to be a great one. Your mantle is beautiful. I love the greenery mixed with silver and white. 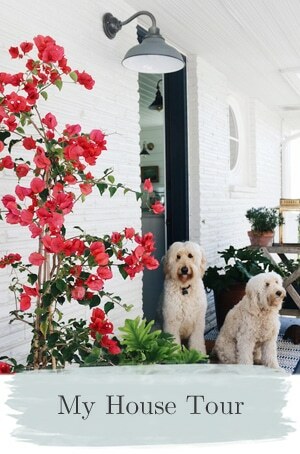 Is your dog a goldendoodle? We just got a goldendoodle puppy…love her! She looks like a mini-version of your dog. I just found your blog and LOVE it. What a beautiful mantle. Your mantle is lovely – so light and fresh. We went with a more subdued colour scheme this year for our mantle. I wanted to tie it in to the new paint colour. Beautiful mantel, indeed! 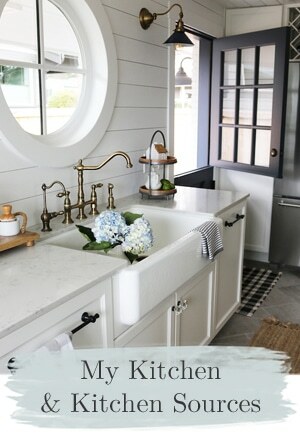 I love the textures you chose to mix together … love it! Your mantel looks wonderful! I especially love the stockings and mercury glass! I have to say that first picture of the dog with the Santa hat makes me laugh every time I see it. He reminds me of a dog from either Fragle Rock or The Muppets. So glad I stumbled upon your blog. I love your dog, Jack. He looks like he could be a sibling to our Pollyanna. How old is he?